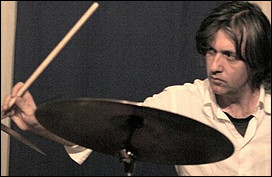 Tony Buck is a drummer and percussionist. He graduated from the New South Wales Conservatorium of Music (now Sydney Conservatorium of Music), becoming involved in the Australian jazz scene. Buck is a member of The Necks and leader of Peril, who he formed in Japan with Otomo Yoshihide and Kato Hideki, and astroPeril. He also formed the short lived L'Beato in the early 1990s, an industrial-oriented outfit reminiscent of Tackhead.